El próximo jueves, tercer jueves de mes, nos reuniremos los Sherry Explorers para nuestra primera reunión. Los nuevos aspirantes a Sherry Explorers harán su juramento o promesa con la copa de jerez en una mano y la venencia en la otra. Después nuestro invitado, el Presidente del Consejo Regulador del Brandy, Evaristo Babé, nos hará una presentación interesantísima sobre el Brandy de Jerez. Luego disfrutaremos de Brandy de diferentes formas y lo maridaremos con algún queso fuerte y algo dulce. ¡Os esperamos! Next Thursday, third Thursday of the month, D´Sherry Explorers will meet, it will be our first meeting after the official presentation. 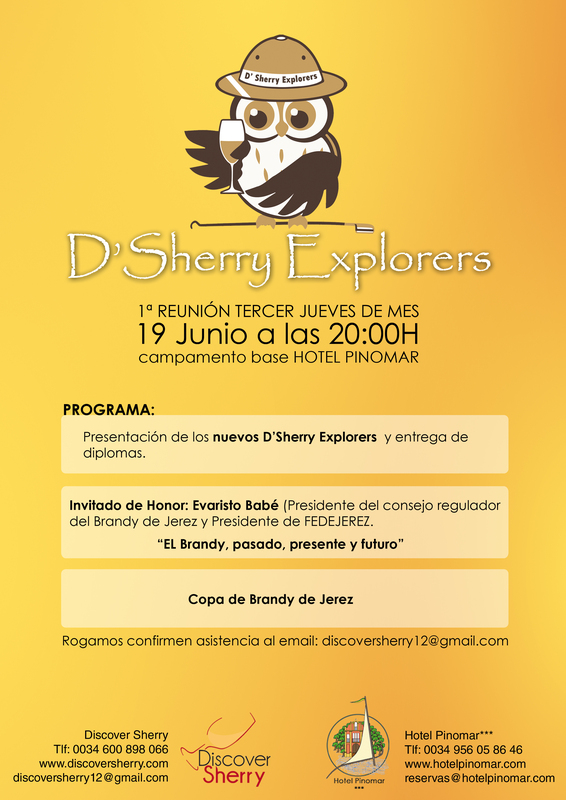 The new Sherry Explorers will do their swearing in with a glass of Sherry in one hand and a venencia in the other. Next, our guest speaker, the President of the Brandy de Jerez Regulatory Council, Evaristo Babé, will make a very interesting presentation on Brandy. After we will enjoy Brandy in different ways and we will pair it with some strong cheese and something sweet. Don´t miss it!